The majority of the Northwest Pacific region is considered to be tropical dry forest and therefore it is the driest region in Costa Rica. Though there is a rainy season, it is much shorter, making it a popular destination for beach goers. The region stretches from northwest Guanacaste to the southern tip of the Nicoya Peninsula and includes popular destinations such as Rincon de la Vieja Volcano, the Gulf of Papagayo, Tamarindo, Samara, Santa Teresa and Montezuma. Rincon de la Vieja is an active volcano with natural hot springs in various places, but most visit for the adventure. The Gulf of Papagayo has the highest concentration of all-inclusive resorts and provides excellent swimming beaches. 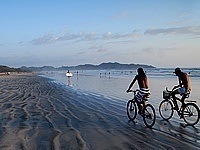 Beach areas such as Tamarindo and Santa Teresa attract surfers, yoga enthusiasts and night life. Playas Samara and Montezuma are more low key and provide a truly Costa Rican feel. Read more about the Costa Rica Northwest Pacific by clicking on the links above or below. For years, Samara has been one of the best kept secrets in Costa Rica, but the word is getting out. This fun little beach town has a variety of small shops and plenty of restaurants to pass time between beaching and adventures. Not to be overlooked, Playa Carrillo is only 5 minutes south and considered to be the most beautiful beaches on the Pacific coast. 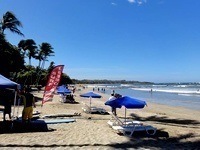 Tamarindo is one of the most fun and popular beaches in Costa Rica. The village is located on a series of beaches that have something to offer just about everybody. Some beaches are good for swimming and boogie boarding or learning to surf, while other beaches are better suited to experienced surfers. The village is home to plenty of restaurants, shops and fun night life. 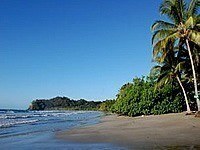 Playa Hermosa is a beautiful beach village located only 20 minutes from Liberia Airport. The beach is a couple kilometers long and lined with palm trees. The quiet village is spread out due to a small mangrove system, but there are plenty of restaurants and shops and close by. Destination type: Somewhat off the beaten path for tourists, but popular among expats. 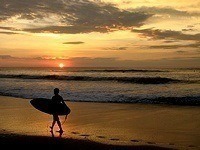 Santa Teresa and Mal Pais are known for great surf, yoga retreats, nightlife and beautiful beaches. This fun beach area is home to some of Costa Rica’s best surfing beaches. There is a wide variety of restaurants, shops, bars, yoga instructors, surf schools and small hotels along the beach drive. 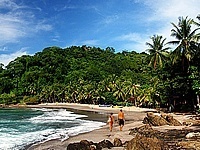 Another well-kept secret, Montezuma is one of the most interesting beaches in Costa Rica. It takes a little effort to access, but a visit to this fun town is well worth the trip. The village is a melting pot of expatriates from various countries and local Ticos. The varied cultures have created a unique atmosphere with a comfortable laid back feel. The town also has plenty to offer in terms of shops and restaurants. The Gulf of Papagayo is home to more all-inclusive resorts than any other location in Costa Rica. The resort area is known for calm swimming waters and beautiful scenery. The weather in this area is great most of the year, with only a couple months of real rain season. The resort area is spread out, with no town center. 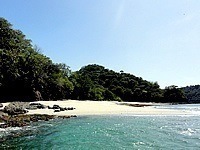 Flamingo Beach is one of the most beautiful beaches on the Pacific side of Costa Rica. This white sand beach is known for great swimming conditions and small waves which are just big enough to boogie board on. The weather in Flamingo is perfect most of the year with only a couple months of rains. The town center has a few restaurants and shops, but is relatively small in comparison with towns like Coco or Tamarindo. 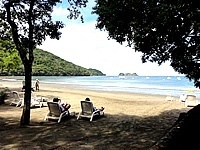 Nosara is a surfside village located in southern Guanacaste. Similar to Montezuma, Nosara has an interesting fusion of local Ticos and expats that combine for a really fun, unique and laid back atmosphere. The gorgeous beaches of Nosara are mostly known for large surfing waves. Lesser known is the fact that swimmers can also enjoy sections of Guiones Beach in front of the surf break. 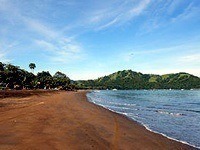 Coco Beach is located only 20 minutes from Liberia Airport in northwest Guanacaste. In the past few years the town has been built up by condominium developers. The beach attracts more local Ticos than international tourists, but is a fun place to visit for nightlife and shopping from other close by beach areas such as Hermosa and Papagayo. Destination type: Somewhat off the beaten path for international tourists, but popular with locals. 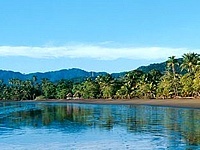 Tambor is a quiet beach village located near the southern tip of the Nicoya Peninsula. It requires a little effort, time and money to reach, but can be worth it if you are looking for a quiet beach area. The village is home to a couple restaurants and a few hotels. Rincon de la Vieja is a national park, volcano and the area surrounding it. 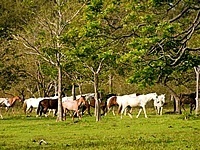 This fun area is located in the northwestern part of the country and home to some of the best adventures in Costa Rica. Popular activities here include hiking to the volcanoes crater, hot springs, canopy zipline, rafting, tubing, horseback riding and more.